The Super Smart Ball Bushing® Bearing family represents a major advancement in linear bearing technology worldwide. These patented and universally self-aligning bearings offer twice the load capacity or eight times the travel life of our industry standard Super Ball Bushing bearing. 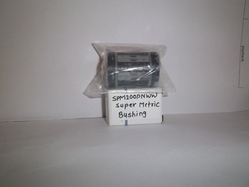 To minimize installation time and cost, the Super Smart Ball Bushing bearing can be ordered factory-installed in an industry standard Single or Twin Pillow Block. 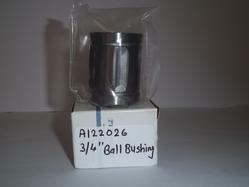 Thomson Ball Bushing A -243848 Precision Steel Ball Bushing bearings offer great improvements in efficiency, productivity, and accuracy over high-friction plain bearings flat-ways. The all-steel design makes the bearing product line perfect for replacing plain bearings in high temperature applications. 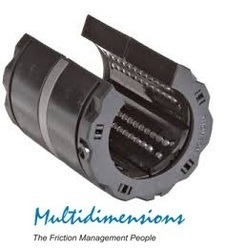 Rigid construction makes them very durable compared to ball bushing bearings with polymer components. When installed in a standard Thomson Pillow Block, the Precision Steel Ball Bushing bearing can self-align up to 3° in all directions. 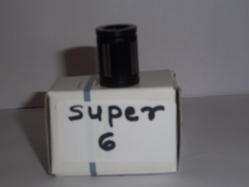 Thomson Super 6 Ball Bushing has been the industry standard for self-aligning linear bearings for over twenty years. This bearing provides three times the load capacity or 27 times the travel life of conventional linear bearings. Besides the dramatic increase in load capacity, the Super Ball Bushing bearing is self-aligning, lightweight and adjustable with a low coefficient of friction. It is a quick and easy replacement for high friction plain Bearings. The wear-resistant, engineered-polymer retainers and outer sleeves reduce inertia and noise in critical, high speed applications. 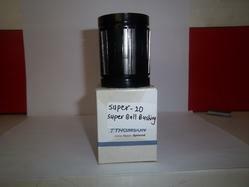 Super 24 Ball Bushing Bearing has been the industry standard for self-aligning linear bearings for over twenty years. 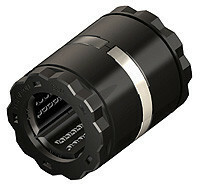 This bearing provides three times the load capacity or 27 times the travel life of conventional linear bearings. Besides the dramatic increase in load capacity, the Super Ball Bushing bearing is self-aligning, lightweight and adjustable with a low coefficient of friction. It is a quick and easy replacement for high friction plain Bearings. The wear-resistant, engineered-polymer retainers and outer sleeves reduce inertia and noise in critical, high speed applications. Thomson A 122026 Ball Bushing bearings offer great improvements in efficiency, productivity, and accuracy over high-friction plain bearings flat-ways. The all-steel design makes the bearing product line perfect for replacing plain bearings in high temperature applications. 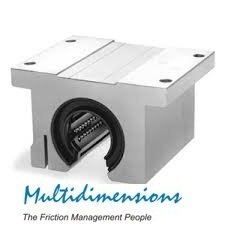 Rigid construction makes them very durable compared to ball bushing bearings with polymer components. When installed in a standard Thomson Pillow Block, the Precision Steel Ball Bushing bearing can self-align up to 3° in all directions. 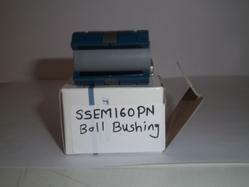 Thomson Ball Bushing SSEM16OPNWW Bearing family represents a major advancement in linear bearing technology worldwide. These patented and universally self-aligning bearings offer twice the load capacity or eight times the travel life of our industry standard Super Ball Bushing bearing. To minimize installation time and cost, the Super Smart Ball Bushing bearing can be ordered factory-installed in an industry standard single or twin pillow block. 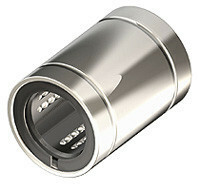 Thomson SPM16OPNWW Ball Bushing Bearing family represents a major advancement in linear bearing technology worldwide. These patented and universally self-aligning bearings offer twice the load capacity or eight times the travel life of our industry standard Super Ball Bushing bearing. To minimize installation time and cost, the Super Smart Ball Bushing bearing can be ordered factory-installed in an industry standard single or twin pillow block. Thomson SPM20OPNWW Super Mertic Ball Bushing Bearing family represents a major advancement in linear bearing technology worldwide. These patented and universally self-aligning bearings offer twice the load capacity or eight times the travel life of our industry standard Super Ball Bushing bearing. To minimize installation time and cost, the Super Smart Ball Bushing bearing can be ordered factory-installed in an industry standard single or twin pillow block. Specification: Nominal Dia 16 mm, Recommended Shaft 16 mm T1 / T2, Dynamic Load 2200 N, Mass 0.023 Kg). 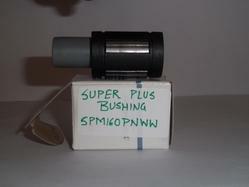 Ball Bushing has been used in this machine with Linear Guide. Currently we supplied in Pinnacle Industries, Pithampur. Thomson Super 10 Ball Bushing Bearing has been the industry standard for self-aligning linear bearings for over twenty years. 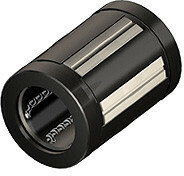 This bearing provides three times the load capacity or 27 times the travel life of conventional linear bearings. 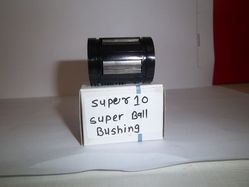 Besides the dramatic increase in load capacity, the Super Ball Bushing bearing is self-aligning, lightweight and adjustable with a low coefficient of friction. It is a quick and easy replacement for high friction plain Bearings. The wear-resistant, engineered-polymer retainers and outer sleeves reduce inertia and noise in critical, high speed applications. 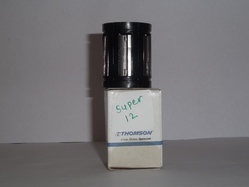 Thomson Super 12 Ball Bushing Bearing has been the industry standard for self-aligning linear bearings for over twenty years. This bearing provides three times the load capacity or 27 times the travel life of conventional linear bearings. Besides the dramatic increase in load capacity, the Super Ball Bushing bearing is self-aligning, lightweight and adjustable with a low coefficient of friction. It is a quick and easy replacement for high friction plain Bearings. The wear-resistant, engineered-polymer retainers and outer sleeves reduce inertia and noise in critical, high speed applications. 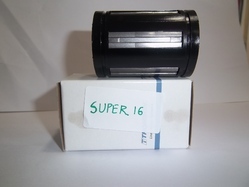 Thomson Super 16 Ball Bushing Bearing has been the industry standard for self-aligning linear bearings for over twenty years. This bearing provides three times the load capacity or 27 times the travel life of conventional linear bearings." Besides the dramatic increase in load capacity, the Super Ball Bushing bearing is self-aligning, lightweight and adjustable with a low coefficient of friction." It is a quick and easy replacement for high friction plain Bearings. The wear-resistant, engineered-polymer retainers and outer sleeves reduce inertia and noise in critical, high speed applications. Thomson Super 20 Ball Bushing Bearing has been the industry standard for self-aligning linear bearings for over twenty years. This bearing provides three times the load capacity or 27 times the travel life of conventional linear bearings. Besides the dramatic increase in load capacity, the Super Ball Bushing bearing is self-aligning, lightweight and adjustable with a low coefficient of friction. It is a quick and easy replacement for high friction plain Bearings. The wear-resistant, engineered-polymer retainers and outer sleeves reduce inertia and noise in critical, high speed applications. 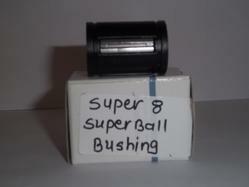 Thomson Super 8 Ball Bushing has been the industry standard for self-aligning linear bearings for over twenty years. This bearing provides three times the load capacity or 27 times the travel life of conventional linear bearings. Besides the dramatic increase in load capacity, the Super Ball Bushing bearing is self-aligning, lightweight and adjustable with a low coefficient of friction. It is a quick and easy replacement for high friction plain Bearings. The wear-resistant, engineered-polymer retainers and outer sleeves reduce inertia and noise in critical, high speed applications. The extremely rigid Ball Bushing Bearings reduces deflection and provides twice the load capacity or eight times the travel life of conventional ball bushing bearings. The bearing's patented ball control technology eliminates binding and chatter (stick-slip), common with high friction, plain bearings. The improvement in bearing capacity permits designers to optimize system compactness and minimizes hardware costs. Ball Bushing Bearings family represents a major advancement in linear bearing technology worldwide. These patented and universally self-aligning bearings offer twice the load capacity or eight times the travel life of our industry standard Super Ball Bushing bearing. To minimize installation time and cost, the Super Smart Ball Bushing bearing can be ordered factory-installed in an industry standard single or twin pillow block. Specification: Nominal Dia 1.25 inch, Recommended Shaft 1 ¼ LPD, Dynamic Load 1170 lbf, Mass 2.1 lb). Machine name: Bruckner Extrusion Machine, Germany. 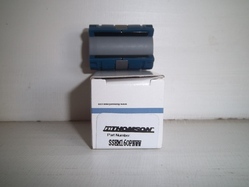 Thomson (Super Pillow Block Bushing) SPB20OPN bearing has been used in Scanner of this machine. Scanner Make: American EGF or Thermo Scientific. Recently we supplied in Cosmo Films Ltd., Aurangabad. Specification: Nominal Dia 0.75 inch, Recommended Shaft 3/4 LPD, Dynamic Load 470 lbf, Mass 0.12 lb). Machine Name: Universal Radial Inserter Machine, USA. Machine Name: Universal Axial Insertion Machine, USA. Ball bushing has been used in this machine in X & Y axis. 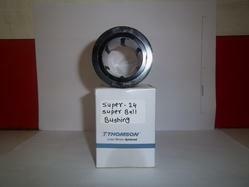 Thomson Super Ball Bushing Bearings has been the industry standard for self-aligning linear bearings for over twenty years. Thomson Super Ball Bushing Bearings provides three times the load capacity or 27 times the travel life of conventional linear bearings. Besides the dramatic increase in load capacity, The Thomson Super Ball Bushing bearing is self-aligning, lightweight and adjustable with a low coefficient of friction. It is a quick and easy replacement for high friction plain Bearings. The wear-resistant, engineered-polymer retainers and outer sleeves reduce inertia and noise in critical, high speed applications. 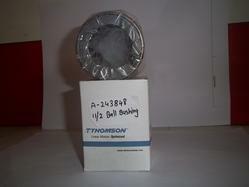 Looking for Thomson Authorised Dealer Ball Bushing ?